Stuart Walker’s design work has been described as life-changing, inspiring, disturbing and ferocious. 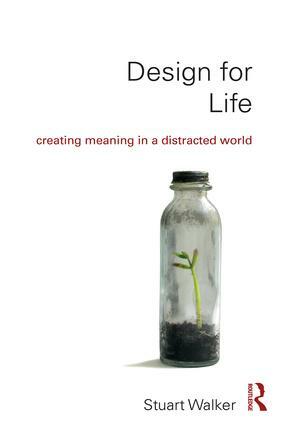 Drawing on an extraordinarily diverse range of sources and informed by creative practice, Design for Life penetrates to the heart of modern culture and the malaise that underlies today’s moral and environmental crises. The author argues that this malaise is deep-seated and fundamental to the modern outlook. He shows how our preoccupation with technological progress, growth and the future has produced a constricted view of life – one that is both destructive and self-reinforcing. Based on over twenty-five years of scholarship and creative practice, he demonstrates the vital importance of solitude, contemplation, inner growth and the present moment in developing a different course – one that looks squarely at our current, precarious situation while offering a positive, hopeful way forward – a way that is compassionate, context-based, human scale, ethically motivated and critically creative. Design for Life is an intensely original contribution that will be essential reading for design practitioners and students. Written in a clear, accessible style, it will also appeal to a broader readership, especially anyone who is concerned with contemporary society’s rising inequalities and environmental failings and is looking for a more constructive, balanced and thoughtful direction. Stuart Walker is Professor of Design for Sustainability at Lancaster University, UK. His design work has been exhibited in Australia, Canada, Italy and the UK, including the Design Museum, London. His numerous books include Sustainable by Design, The Spirit of Design and Designing Sustainability, also published by Routledge.